Weeding tools come in a variety of shapes and sizes. These handy gardening helpers work well for trying to remove deep rooted weeds from your garden areas. 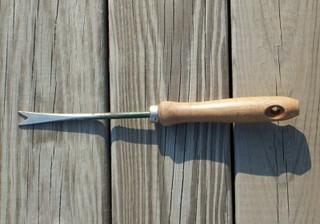 Below is a short-handled dandelion weeder. There is also available long-handled versions of this tool. Personal preference allows you to decide which you would prefer to use when removing your garden areas of unwanted plants. You'll want to purchase a weeder with a stainless steel body. A stainless steel tool will be sturdy and rust resistant to give you many good years of gardening help. The sharp points on this tool allow it to be sunk deeply into the ground. 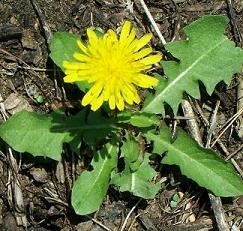 Dandelions are typically the best known, long rooted plant you'll want to remove from your garden. Be sure the handle is comfortable for you to grip. The hand-held versions of this tool are also available in a smaller, lighter style yet still made from the same sturdy materials as the full size tools. The process of removing dandelions works better if the ground is wet. Simply lift the dandelion leaves and set the weeding tool just outside the top of the root and pointed into the ground. Try to sink as far and as straight down into the ground as you possibly can with the tool. Push forward and back on the dandelion root to loosen it. Do this on at least two sides of the root. When you've loosened a couple of sides, pull back on the tool and pull up on the weed. You should be able to pull out a good length of, and possibly even all of, the plant's root. If you're not able to get the entire root, the notched V on the tool will allow for the roots to be cut off deep underground and should help prevent regrowth. © 2007 - 2018. GardenBrief.com All Rights Reserved.